The old palace museum and craft village. Another visit I forgot to mention earlier was the trip out to a craft museum and village. Wished we could have stayed longer as there was so much to see. The museum was typically dusty and unkempt with peeling, faded display cards, no lighting and really dodgy display methods (nailing old objects to the cabinet walls?! ), but we did find some incredible objects, particularly a woven metal rug and basket; though still does not match the glory of the huge woven ivory carpet in Dhaka museum. 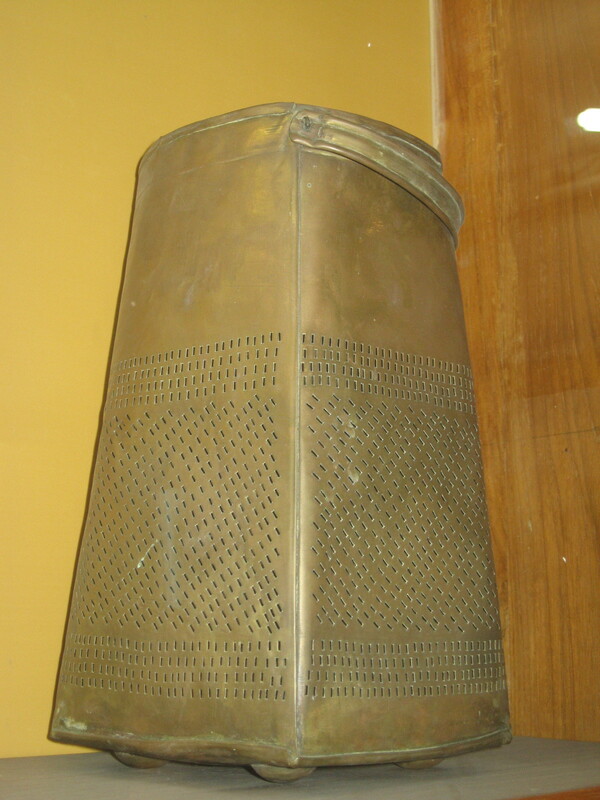 I was also taken with the form and patterns of a brass watering can. Hard to photograph in the gloom behind glass with my little camera. 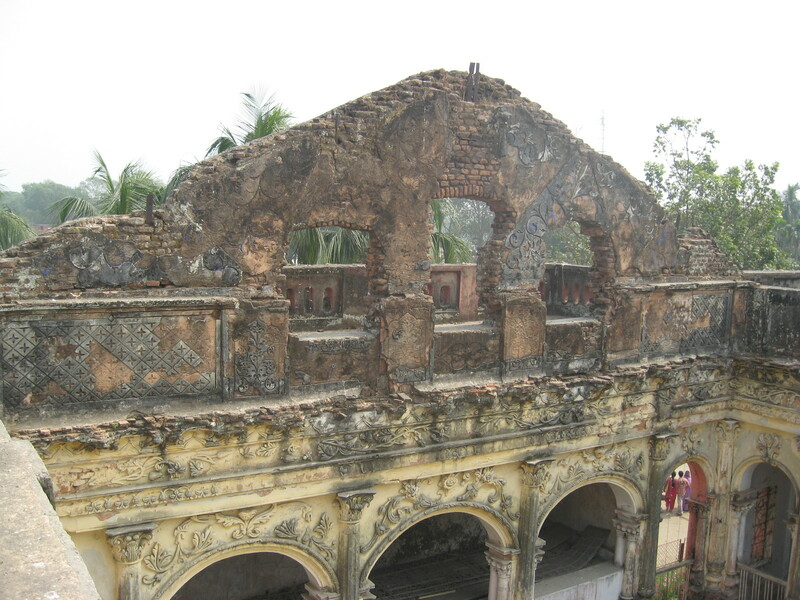 The atmosphere of the palace is what will remain with me; all the cool, dark, interconnecting rooms and the central courtyard where dancers entertained the Nawab after dinner. 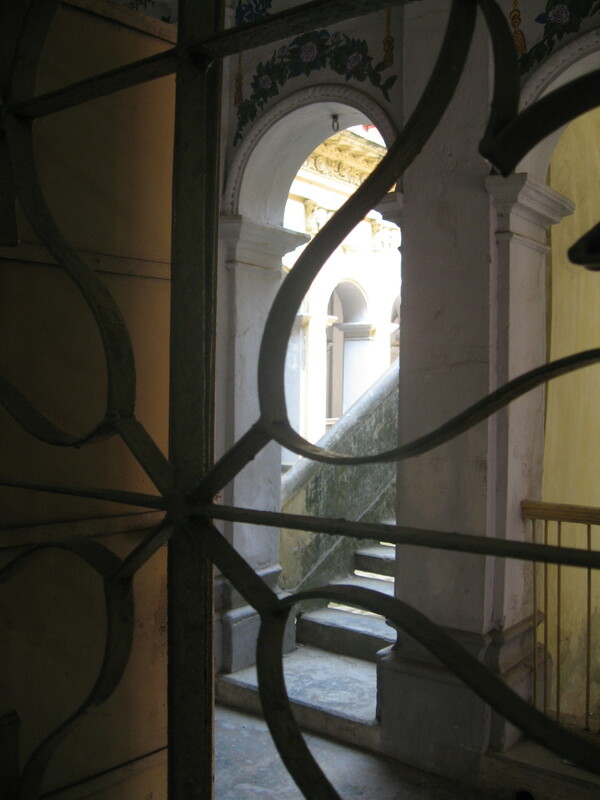 There were so many little grilled windows opening onto secret vistas. Am reading a book at the moment set in 18th Centuary Bengal, and all the rituals of serving and preparing food, dressing, protocol, and the intrigues of domestic politics, left me imagining the machinations of the extended family and servants who would have whispered through the corridors of the palace in its hey day. Some beautiful mosaics and mouldings remain but basically the building is being allowed to crumble at the moment. The upper floor seems to be a dumping ground for museum waste (helped myself to loads of old ticket stubs), piles of broken pots and wood etc. Such a shame. Climbed up onto the roof and from there could survey the old empire. The government has built a new museum, not far off, a very plain, functional building which is obviously considered the place to visit. Nearby was a craft village. So much more alive than the museum. 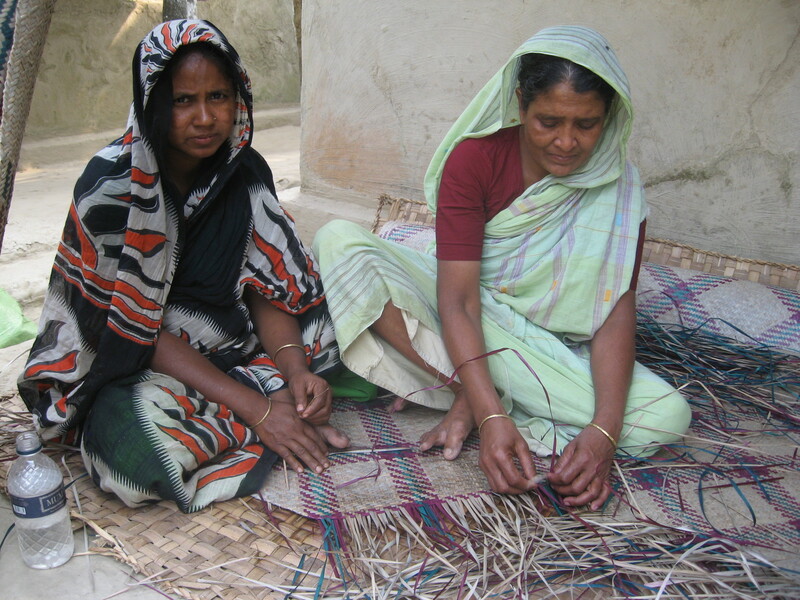 The women weaving mats and doing traditional kantha embroidery were inspirational. Wished we could have stayed and watched them for longer. 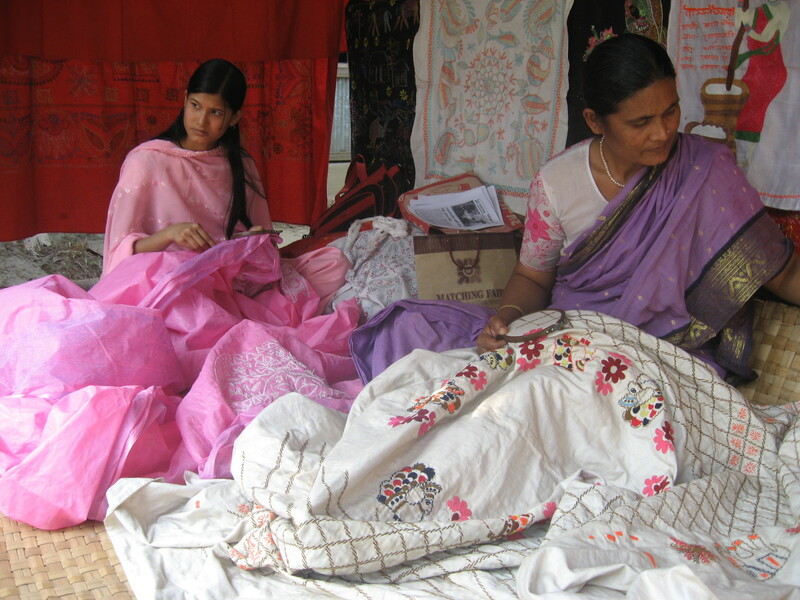 It takes them so long to make their gorgeous work and yet it sells in the shops in Dhaka for relatively little. Wonder how they manage. Was also delighted to find, and buy, some raw shola from one of the craftsmen. 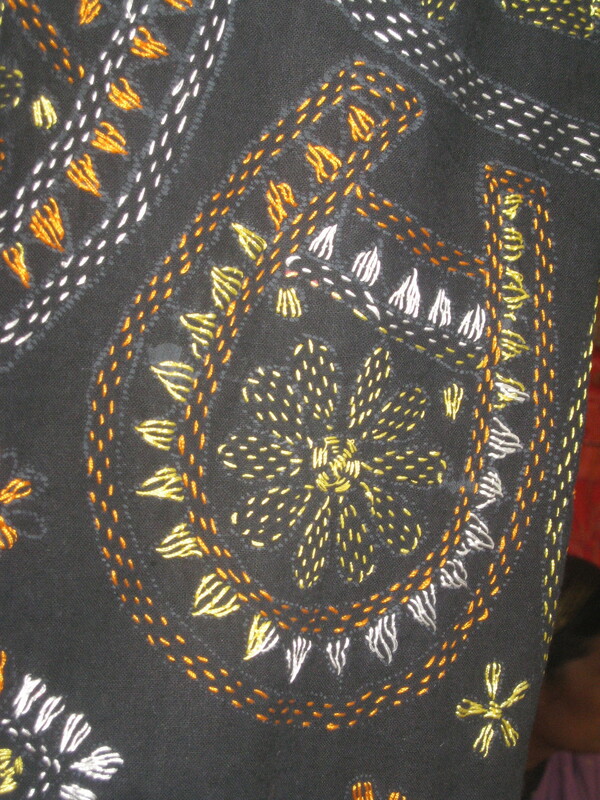 Still not sure why, but it is so close to paper and unique to Bangladesh, so there may be something to work with there. There is a large Kantha wall piece in the room here at Owen’s, which has found its way into my dreams. The little running stitches are remarkably fine, like loads of tiny dashes. A way of writing or drawing. Have been making drawings of the patterns they use; typically lots of intricate circle and paisley patterns and stylised people and animals.